Kale. The ultimate pizza topping? We love a bit of Friday or Saturday night home made pizza action around here. There’s usually a list of tried and true toppings we reach for every time. Potato & rosemary, tomato & basil, salami and ricotta, prosciutto… to name a few. But every now and them I get inspired to try something new. You can imagine the response I got when I suggested to my Irishman that we try kale on our pizza last weekend. But I tried it anyway. And am glad I did! 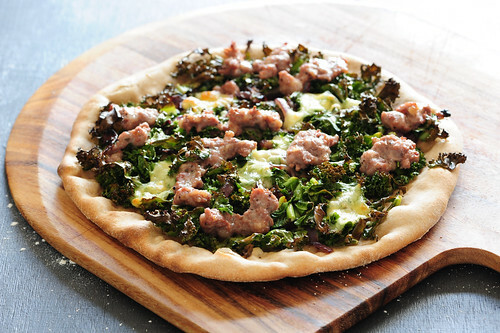 We both LOVED the earthy greenness of the kale pizza, with the kale edges all crispy and cheesey. I think we’ve found a new favourite pizza (second to potatoes, of course). 1. Preheat oven on its highest setting and place a pizza stone on the floor of your oven. 2. Cook onion in a little oil on a medium heat until soft but not browned. 3. Add kale and cook, stirring occasionally until the kale is wilted. Season. 4. Roll out pizza dough. Scatter over the kale and onion mixture. Top with both cheeses. 5. Bake for 5-10 minutes or until the dough is cooked and the cheese melted. Note: the image above also has some pork sausage on the pizza… it’s equally good without!